Subway workers in the London Underground walked out today in a 24-hour strike timed to cripple the subway system on a night when tens of thousands of revelers were planning to celebrate the New Year in the city. Guards and ticket office workers began leaving their posts from noon and the service was expected to slowly run down into the evening as others finished shifts and were not replaced. And as a carpooling/walker/bike riding New Yorker who just went through this -- in sub-freezing 20 degree F temperatures for 3 days recently, the only advice I have for the London tube riding public is to dress accordingly, and hope management and the transit workers reach an agreement soon. As we've already seen, leverage, i.e., pulling these strikes at the most inopportune times, just before Christmas, New Years Eve, etc., does indeed carry a strong message on many levels, with the riding public (somehow) being left to carry the brunt of the most readily seen hardships involved. In any event, Happy New Year, one and all. Health, peace, and happiness in 2006, and always. Anyway, have a very Merry (feel free to fill in here) and I'll talk to you again soon. Until then, as always, may *peace* above all continue to be yours. Still undecided on the perfect holiday gift as the shopping days slowly dwindle down to a precious few? NPR reporter Karen Grigsby Bates shares her list of books that would make great gifts for the holidays in her Day To Day column, dedicated to making the decision a bit easier. And, I don't mind saying that City of Falling Angels, by John Berendt and Anton Chekhov: The Complete Short Novels have already been purchased -- and wrapped -- for placing under the tree by yours truly, from this list of what I think are some excellent literary gift-giving suggestions. And don't forget that these days you can also read with your ears (and no...it's not considered cheating, or at least, it shouldn't be). Downloadable books are great company for travelers and people who spend a lot of time going about their daily lives, where their eyes need to be focused in other places, rather than on a page. Without a doubt, few would argue that no matter how old we get, most of us still enjoy being "read to." As a result, the latest audiobook companies provide high-quality audio with great readers (often actors) that make the pages fly by. Audible.com, Amazon and iTunes all offer downloadable titles that you can play on your computer, burn on CDs, or send to your MP3 player, so your chosen story travels with you. I've found that for long-distance driving especially, nothing can beat a good story, told in an engaging, made-for-good-storytelling voice. Therefore, books on audio, when necessary, certainly get my vote. Happy shopping, and an even happier pre-holiday weekend. Peace. Nearly three months after Hurricane Katrina ravaged New Orleans, chef Emeril Lagasse has reopened the doors of his Nola restaurant yesterday, just after reopening his flagship restaurant there last week. No word yet on the reopening of Delmonico's, the third of the three he runs in the Big Easy. "There's been a lot of tough moments for me personally," Emeril said recently. "There have been a lot of personal losses; a lot of personal friends lost everything. I'm still here. I'm still smiling. I'm still determined. And we are going to help and do our part to build the city back." 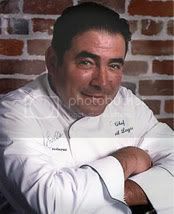 Read more here about Emeril's recent 1.4 million dollar celebrity fundraising effort for further Katrina recovery. Way to go, and glad to hear you're back. Few people know, that in addition to being one of the greatest comic geniuses of modern times and the forerunner for scores of comedians who came after him, he was also a talented and prolific writer. From his noted credits for such hit movies as Mel Brooks' Blazing Saddles to his work on TV shows such as The Flip Wilson Show and Sanford & Son, he wrote just about as well as he stood in front of a microphone and entertained us for over 3 decades -- starting with his very first appearance on the Ed Sullivan Show back in the 60s. He made us laugh, cry, and sometimes even mad as hell at some of the outrageously destructive things he did, often to his own detriment. 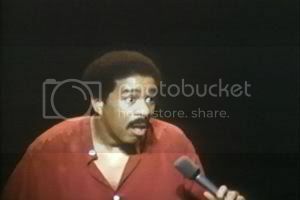 But more than anything else, through his comedic observations and constant pushing of the "censorship" envelope, he made many of us…think. And for that, we'll truly miss him. The UK mobile (cell phone) service known as Vodafone has partnered with mobile content firm Inventa to offer film clips of Britain's premiere chef and cookbook author, Jamie Oliver, making over 100 of his top recipes as downloads exclusively through its 3G Vodafone live! service. The service allows users to search for a recipe according to event or by ingredient. Picture messages providing a list of the ingredients can also be downloaded to the phone. Inventa has used the original film footage from Oliver’s Twist, a show Jamie filmed for the US which has never been seen before in the UK. Read more about it here and be sure to catch Jamie on Oliver's Twist on the Food Network Channel. Also, don't forget that here in the US, Jamie's segments along with several other Food Network programs can be seen regularly at the checkout counter of many of your local supermarkets. A perfect example of this would be just last night as I stood on the checkout line at my local Pathmark Supermarket here in New York, and watched a few minutes of these programs on a small video screen through a new customer service called Pathmark TV. Either way, you've gotta admit that it all makes the age-old question of "What's for dinner" these days -- a bit easier. Doesn't it? For a handful of gifted-yet-underprivileged fourth grade students in the South Bronx, their future clearly began when substitute teacher and part-time chess master, Richard Mason, taught them to "pick up the pieces." Delivering what I personally think is a far cry from his "Sam Malone" days on the hit TV series, Cheers, for me Ted Danson gave the absolute best performance ever in last night's premiere showing of The Knights Of The South Bronx on the A & E cable network. Playing the role of an out-of-work former member of the corporate world, Danson's character, Richard Mason, takes on the job of a substitute teacher in the Bronx to keep some of the mounting bills paid on his comfortable life in the suburbs. But soon, while trying to reach a classroom of black and Hispanic students who have apparently lived more "life" and hardships in their few years here on earth than he could ever imagine, he finds that the best way to reach them on an academic level is to introduce them to his greatest personal love -- the game of chess. And through this, he also manages to teach his students, that like chess, there are some things in this life where what you look like or where you might come from, matters less than zero. Certainly, as far as the game of chess is concerned -- all that matters is the sharpness of your mind and nothing else. As he constantly reminds his students: "No one can ever call you stupid if you can beat them at a game of chess." If you never see another made-for-TV movie for the remainder of this year, I strongly recommend that you see this one. And needless to say, I'm already a die-hard fan of young Antonio Ortiz, who played the role of five-year-old, Dawson, the younger brother of one of Mason's students, and the very first of his protégés to win at a championship chess match -- against an opponent *twice* his age. Clearly, guys, this movie is a must-see, so check your listings and DON'T miss it! Have a great Wednesday, all. Peace. Wikipedia, the online encyclopedia that allows anyone to contribute, will be tightening its rules for submitted entries. This change comes less than a week after John Seigenthaler Sr., who was Robert Kennedy's administrative assistant in the early 1960s, wrote an op-ed article revealing that Wikipedia had run a biography claiming Seigenthaler had been suspected in the assassinations of the former Attorney General and his brother, President John F. Kennedy. As a result of this and other past discrepancies, Wikipedia will now require users to *register* before they can create articles. I've been looking for this one throughout the month of Novemeber (its proposed debut month), but never seemed to be able to catch it. In any event, the Travel Channel has its chef and novelist Anthony Bourdain, and now it looks as if the Discovery Channel has its very own four-star chef and cookbook author, Marcus Samuelsson in a new series titled, Inner Chef. A native of Ethiopia who was orphaned at the age of three, Samuelsson eventually found his truest passion -- in cooking. Influenced by his adoptive Swedish grandmother, a professional cook, while growing up in Sweden, Samuelsson began helping out with family meals by the time he was six. When he turned 16, he decided upon a career in the culinary field and attended the Culinary Institute in Goteborg, Sweden. After graduating, he apprenticed in various countries including Switzerland and Austria. In 1992, he was selected to apprentice for eight months at Aquavit in New York City. At the time, Hakan Swahn, owner of Aquavit, was working to establish an unprecedented identity for Swedish cuisine in the United States, and he recruited Samuelsson to help him achieve his goal. After his apprenticeship at Aquavit, Samuelsson traveled to France to work for world-renowned Georges Blanc at his three-star Michelin restaurant. In 1994, Samuelsson returned to Aquavit and worked his way up through the ranks to become the executive chef. Since then, he has received numerous accolades including a three-star review from The New York Times, an award for "Rising Star Chef" in 1999 by the James Beard Foundation, a four-star rating in Forbes and an award for being one of "The Great Chefs of America" from the Culinary Institute of America. Samuelsson has also been featured in Gourmet, USA Today and has appeared on CNN, ABC's Good Morning America. And now, the Discovery Channel is bringing his award-winning talent and unique creativity to kitchens like yours across America in the new Discovery Home series Inner Chef. In the series, Samuelsson visits a different homeowner in each episode, getting to know the homeowner and identifying their hopes and fears in the kitchen so that he can help to discover and unleash their "inner chef." In the process, he brings creative and practical solutions to the problems of an average kitchen and an average cook. Having once lived in Sweden, France and the United States, he draws upon several culinary traditions to surprise and delight his trainees. Samuelsson cooks side by side with the homeowner, planning and organizing a special meal event — a dinner party or a special dinner in someone’s honor — while his apprentice learns a whole new way to utilize the kitchen. First, he familiarizes himself with the homeowner's personality and lifestyle, inspecting the cupboards, pots, pans, accessories and appliances and noting what the kitchen lacks and what changes could improve the cooking experience. After outlining what is needed to plan the menu and prepare the meal, he cooks alongside the homeowner and demonstrates ways to spice up dishes and simplify cutting and cooking techniques. After preparing the meal, he presents the food like an artist, making certain dishes are beautiful to the eye. If a homeowner doesn’t have the perfect table setting or a complete set of serving dishes, he shows how to improvise, borrowing from the homeowner’s different collections. So do check your local listing for exact times to watch this young culinary artist work his magic -- while I also continue to look out for the best time (?) to catch it in my own neck of the woods. As I've already mentioned, Marcus Samuelsson is the author of Aquavit : And the New Scandinavian Cuisine . One of the treasures I'm proud to say that I have on my cookbook shelf, Aquavit is illustrated with vibrant color photographs that echo the pleasures of the food they display. Without any doubt, this book is as special as its innovative and worldly author. Well, it's for certain that this weekend will be a non-stop busy one for me, but I do hope yours will be a great one wherever you might be. So whatever the case, let's all make it a good one. Peace.